The 2019 Carolina Jazz Festival is Thursday, February 14, 2019 to Saturday, February 16, 2019. Annual Valentine’s Jazz Concert featuring the jazz ensembles from Duke University, the University of North Carolina at Chapel Hill, and North Carolina Central University, John Brown, Jim Ketch, and Ira Wiggins, Directors. Admission $15 General Public and $10 Students. Juan Alamo, vibes; Aaron Hill, saxophones; Jim Ketch, trumpet; Stephen Anderson, piano; Jason Foureman, bass; Dan Davis, drums. The faculty will be joined by guest artists Bryan Carter, drums; and Roland Barber, trombone. Free. UNC Jazz Combos featuring guest artists Bryan Carter and Roland Barber. UNC Jazz Band, Jim Ketch, Director with guest artists Bryan Carter, drums and Roland Barber, trombone. Scholarship Benefit Concert. Admission $10. Founded in 1977, the Carolina Jazz Festival (CJF) promotes a broad range of programming spanning performance, education, and scholarship. Our 2019 Carolina Jazz Festival will be the 42nd festival led by current Director of Jazz Studies Jim Ketch. 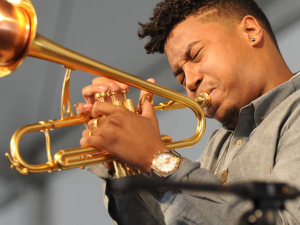 Headlining the 2019 festival is the Christian Scott Quintet. Drummer Bryan Carter and trombonist Roland Barber will serve as Artists-in-Residence for the festival. For additional information about the Carolina Jazz Festival, contact Festival Director Jim Ketch (jketch@ad.unc.edu). The CJF links UNC-Chapel Hill to the educational wing of Jazz at Lincoln Center (JALC). The festival features the North Carolina Regional Essentially Ellington High School Jazz Festival (14 years) which has engaged student participation from North Carolina, Virginia, Washington D.C., Georgia, and New Jersey. In addition to the Artists-in-Residence for CJF, the JALC also clinicians for the regional EE festival. In addition to the performances by Christian Scott, the Jazz Faculty Ensemble and Artists-in-Residence Bryan Carter and Roland Barber, the EE festival will feature concerts featuring the UNC Jazz Combos and the UNC Jazz Band. The EE festival will feature performances by over a dozen high school jazz bands and a dozen high school jazz combos. The Carolina Jazz Festival also partners on the UNC campus with Carolina Performing Arts and a host of other organizations that provide financial and organizational support to the festival. With a confidence reflecting an instrumental and compositional maturity that both belies his age and announces the arrival of a remarkable talent, Bryan Carter exudes what promises a highly successful career. Shortly after completing his training at The Juilliard School in New York City and still at the very outset of his career, Carter has already played and/or recorded with many notable artists including Clark Terry, McCoy Tyner, Wynton Marsalis, Marcus Roberts, Mulgrew Miller, Kenny Barron, Michael Feinstein, and Kurt Elling. Carter attended The Juilliard School as a Jazz Studies major and studied with Carl Allen and Kenny Washington. He was the recipient of the Irene Diamond Scholarship as well as the Samuel L Jackson Scholarship. While at Juilliard, Carter took a strong interest in composition, orchestration and interdivisional cross-collaborative performance. Bryan is currently touring the world with his band, “Bryan Carter & The Young Swangers”. 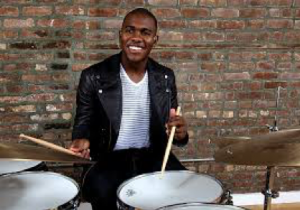 He also served as the house drummer for NBC’S “Maya & Marty” starring Maya Rudolph, Keenan Thompson, and Martin Short. The show has featured guests including Miley Cyrus, Tom Hanks, Drake, Steve Martin, and Tina Fey. Aside from performing Carter conducts clinics, master-classes, and workshops at schools, colleges, and universities around the world. Currently, Carter serves as a teaching artist for the Jazz at Lincoln Center, “Jazz for Young People” program in New York City and endorses Ludwig Drums, Vic Firth Drumsticks, Remo Drumheads, Zildjian Cymbals, and 1964-Ears Monitors. Roland Barber has performed with an impressively diverse list of artists including Chaka Khan, Duke Ellington Orchestra, Wynton Marsalis and Jazz at Lincoln Center, Kirk Whalum, the Wooten Brothers, the Chico O’Farill Orchestra, Robin Thicke, the Temptations, Manny Oquendo y Libre and the NBC Saturday Night Live Band. He’s performed in venues such as Carnegie Hall, Birdland, the Blue Note, the Beacon Theater, Lincoln Center, the Copacabana, the Kennedy Center, and Madison Square Garden. 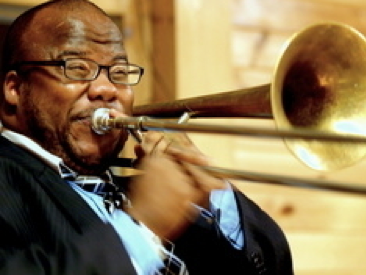 In terms of influencing his distinct jazz style – Along with jazz master J. J. Johnson, Roland credits Steve Turre, and Al Grey as his “Big Three”, the most significant contributors to his contemporary style of jazz trombone. Also having a deep impact on Roland’s style is the joy of connecting to listeners through a vocal concept to the instrument, embodied by masters such as Clark Terry and Al Grey. Roland also believes in drawing on the strength of an ensemble and community to create music, modeled by Duke, Count, Blakey, and so many of the great soloist-infused big bands and small groups of the post Bop era. Finally, developing and sharing music with twin brother/saxophonist Rahsaan Barber has had a profound impact on Roland’s development, most easily perceived in his formidable technique, wide stylistic vocabulary, and an awareness and affinity for the music of saxophonists Dexter Gordon, Stanley Turrentine, and John Coltrane. This pairing produced the album “Twinnovation,” which put the Barber Brothers on the map in the national jazz scene. Roland has also gained much acclaim as a composer and arranger. In 2007 he was awarded a prestigious grant from Chamber Music America which funded the composition and premieres of his original suite entitled: Songs of the Village. This work saw its world premiere at Jazz at Lincoln Center’s Dizzy’s Club in NYC. Roland is quite active as a teacher and educator of musicians from all walks of life. Besides being motivated by a love to teach, Roland has attended virtually every major jazz educational classroom in the country. Roland has taught private study of trombone, jazz history, big band, and jazz improvisation in Manhattan School of Music’s Pre-College Program for NY area’s talented youngsters. Christian is the progenitor of “Stretch Music,” a jazz-rooted, genre-blind musical form that attempts to “stretch” jazz’s rhythmic, melodic and harmonic conventions to encompass as many other musical forms, languages, and cultures as possible. Jazz is a progressive musical movement and Christian is at the forefront of its continued viability as an art form. Christian’s 2015 release, Stretch Music, marked the partnership between Christian’s Stretch Music record label and Ropeadope Records. Critics and fans alike have praised the recording. Stretch Music is also the first recording to have an accompanying app, for which Christian won the prestigious JazzFM Innovator of the Year Award in 2016. The Stretch Music App is an interactive music player that allows musicians the ability to completely control their practicing, listening and learning experience by customizing the player to fit their specific needs and goals. In 2017, Christian released three albums, collectively titled The Centennial Trilogy, that debuted at number one on iTunes. The albums’ launch commemorated the 100th anniversary of the first Jazz recordings of 1917. The series is, at its core, a sobering re-evaluation of the social-political realities of the world through sound. It speaks to a litany of issues that continue to plague the collective human experience, such as slavery in America via the Prison Industrial Complex, food insecurity, xenophobia, immigration, climate change, sexual orientation, and gender inequality, fascism and the return of the demagogue. The first release in the trilogy, Ruler Rebel, vividly depicts Adjuah’s new vision and sound – revealing Adjuah to the listener in a way never heard before via a completely new production methodology that stretches trap music with West African and New Orleanian Black Indian masking tradition musical styles. Ruler Rebel’s release coincided with the first annual Stretch Music Festival at Harlem Stage in New York. The Stretch Music Festival, created and curated by Christian, explores the boundaries of Stretch, Jazz, Trap, and Alternative Rock with some of music’s most poised and fiery rising stars. The sold-out performances were met with praise from both music critics and fans. The second release, Diaspora, was showcased during Adjuah’s sold-out Carnegie Hall performance in 2017. The third release, Emancipation Procrastination, launched in September 2017 during NPR’s global Jazz Night in America broadcast from New Orleans. Christian scored his identical twin brother’s and Director’s Guild of America 2015 Student Award recipient, writer-director and Spike Lee protégé, Kiel Adrian Scott’s, recent Student Academy Award-nominated film, Samaria. Christian also scored Kiel’s award-winning film, The Roe Effect. He will also score Kiel’s feature length directorial debut, slated for production late 2018. In addition to scoring documentaries for Hennessy Cognac and others, in 2017, Christian has scored commercials for Tag Heuer watchmakers and The Gap clothing company, as well as music for ESPN’s Sports Center. Christian has also recently completed a music project, in which he served as leader, in conjunction with 1800 Tequila and Billboard Magazine called The Refined Player’s Series. 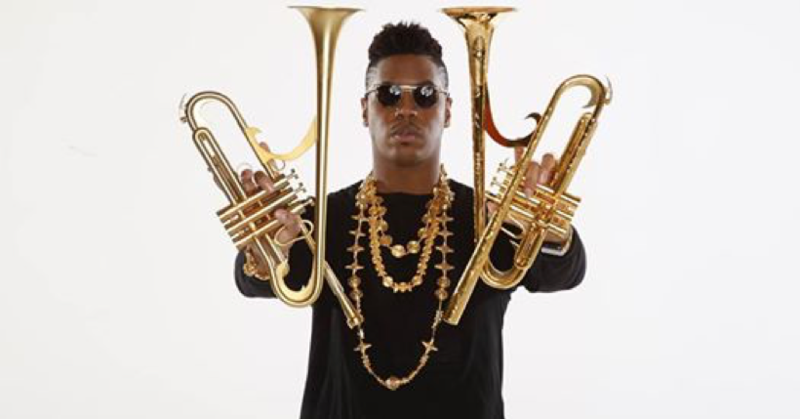 Additionally, through his partnership with Adam’s Instruments, Christian designed a signature line of horns, the Siren Trumpet, Sirenette, and Reverse Flugelhorn that are revolutionizing brass instrument design all over the world. Domestic production of Christian’s proprietary reverse flugelhorn will begin in 2018. Christian is a scion of New Orleans’ first family of art and culture, the Harrisons, and the grandson of legendary Big Chief, Donald Harrison Sr., who lead four nations in the City’s masking tradition. The HBO series, Treme, borrowed the name “Guardians of the Flame” from African-American cultural group Scott began “masking” as a member of with his grandfather in 1989. Christian recently became the Chief of The Brave, in February 2017, one his grandfather’s early banners. In 2018, Tulane University’s acclaimed Amistad Research Center announced its archive of the Donald Harrison, Sr. legacy papers to highlight the Harrison/Scott/Nelson family’s contributions to the arts, activism, and African diaspora cultural expressions. The Harrison family’s story has been documented by Oscar-winning director, the late Jonathan Demme, in his post-Hurricane Katrina works. As an artist, I am always attempting to do things that haven’t been done. This goes beyond simply trying to be adept at something. It requires the ability to revisit past thought processes while considering new landscapes, along with continuously redefining oneself through failures as much as successes. Regardless of the path taken, I have found one of the biggest challenges for an artist – especially a younger one – can be learning how to navigate others’ imposing their thoughts or opinions of what artists should and should not do. Be it from those who consider themselves experts on the process, or those who just like to comment or judge. Over time, I have learned that people will always have opinions and will always seek opportunities to express those thoughts and sentiments. At the crux of their argument is the same preoccupation with defining Jazz that has been part of the music since it was first called “Jazz.” The whole matter rests on the line that separates the word “Jazz” as a definition as opposed to a description. Using the term to describe my work is fine by me. However, just because it can be said that my work is inherently Jazz does not mean that it is exclusively Jazz. It is also important to note the fundamental difference between a definition and a description. When one defines something, they are forcing it to exist within the confines of its explanation. A description, on the other hand, is a discourse intended to give a mental image of an experience or an account of the relevant characteristics or qualities of something. So, in this sense, Jazz as a definition separates, excludes, and misses out on being open and free to grow. In my opinion, it’s freedom that actually defines Jazz and has given new life to the form. To the ears of those earlier referenced veterans, what came before had value and therefore had to be respected. I feel it’s just as important to be open to what is coming next and that each generation should have a chance to create and contribute something of their making. I would be lying if I said my elders and I agreed to disagree. We did not. I left the conversation pretty upset, actually more pissed off than pretty upset. Then, I thoughtfully weighed their words. The more I was willing to listen to where they were coming from, the more my stance evolved from what was a relentless search to find something new, to combining that search with a want to create music that will be as relevant now as the music they grew up with. They want to hear that younger artists have done the homework, the same due diligence that members of their generation were required to know and exhibit. I found inspiration in that and it definitely made me think more conscientiously about the music I am making. I realized that if I am truly going to be a voice for this time, I have to consider multiple perspectives. Their critique helped me understand that a firm knowledge of what came before is equally as important as an unflinching willingness to seek new landscapes and opportunities. A marriage of these ideas could create a truly lasting impression that could inspire a new generation to reach – to stretch – further. I have heard some describe our approach as “stretch,” or calling what we play, “stretch music.” It’s true that we are attempting to stretch—not replace—Jazz’s rhythmic, melodic and harmonic conventions to encompass as many musical forms/languages/cultures as we can. My core belief is that no form of expression is more valid than any other. This belief has compelled me to attempt to create a sound that is genre blind in its acculturation of other musical forms, languages, textures, conventions and processes. This is done as a means of extending the dialogue of the human condition across the lines of cultural and genre based barriers. As an example, if I take five people from completely different cultural/linguistic backgrounds and put them in a room with an objective of collective participation, they are going to have to reevaluate the way they communicate. They are going to have to learn to communicate in a way that is clear to one another in order to achieve their goal. It is as much a philosophy as a musical approach—diplomacy in music if you will. Recognizing that all points of view are in fact legitimate, and from there, choosing to learn to communicate in a way where you can reach a consensus. This is what you will hear on our recordings; a stretching of Jazz, not a replacement. And this is what I hope younger people will be able to take away from it as well: the idea that innovation should never be regarded as a problem in artistic practice, that one should always be aware of what has come before, and finally, that criticisms shouldn’t evoke paralysis, they should inspire action. This is achieved through the use of a new harmonic convention I call a Forecasting Cell. In 2009 I began to delve deeper into my studies of harmonic intent and it dawned on me that the only way to give a clearer explanation of what one wants to convey musically, would be to create a means of questioning the improviser, thus forcing him to clarify his/her statements. It is my observation that no matter what context or environment someone is in, the tactic that is most commonly employed to reach a better understanding of something is a question. And just as questions are framed in a way that imply what the questioner seeks to know, Forecasters are also designed in a way that imply musical answers. A Forecasting Cell is a harmonic convention that illuminates the end result of a harmonic sentence preceding its resolution. Because the end result of the harmonic sentence is already outlined, the improviser and accompanist are coerced into a constant reevaluation of the topography of the harmonic/melodic landscape, ultimately resulting in the improviser being forced to question before he renders a verdict. This questioning not only makes the intentions of the improviser clearer but also, through a constant reevaluation of the harmolodic landscape, helps in sharpening the communal dialogue of the unit. Both “Yesterday You Said Tomorrow” and Christian aTunde Adjuah/Christian Scott were composed with Forecasting Cells as their primary harmonic conduit. The 2019 Carolina Jazz Festival at the University of North Carolina at Chapel Hill (year 42!) is proud to collaborate with Jazz at Lincoln Center to bring the internationally recognized and acclaimed Essentially Ellington High School Jazz Band Festival to North Carolina. On Saturday, February 16, 2019, The Carolina Jazz Festival will host the 14th annual North Carolina Regional Essentially Ellington High School Jazz Band Festival (EE). We invite you to complete the registration form found at the end of this letter as soon as possible, as we will fill our limited performance vacancies on a first-come-first-served basis. Make note, that we offer both a jazz band and jazz combo division. Our registration form and this letter will be placed on the www.music.unc.edu/jazzfest website. You may register to perform or to simply attend and observe the festival and workshops. We will make registration open to all NC high school jazz bands and jazz combos. Registration for the Carolina Jazz Festival is $150 for either a jazz band or combo. Directors wishing to bring two to four groups may do so. We limit participation by one school to no more than two jazz bands (no more than 4 ensembles total from any one school). Registration for two ensembles is $250; three ensembles is $300; four ensembles is $325. Mail checks to James Ketch, Carolina Jazz Festival, Department of Music, Kenan Music Building, CB#3320, University of North Carolina, Chapel Hill, NC 27599-3320. We will accept registrations until January 25, 2019 when we will begin to put together the festival schedule and program. All high school ensembles participating in the festival are required to join Jazz at Lincoln Center’s 2018-2019 Essentially Ellington program. By joining the free program, directors will receive original big band transcriptions from JALC. New members can join the program online by visiting jazz.org/ee and by completing an online membership form. For questions about the Essentially Ellington program contact Maegan McHugh at 212-258-9810 or ee@jazz.org. • and one score to be a director’s choice from any genre. • One of these three compositions, whether swing, ballad, Latin, etc., must be from either the current repertoire or previous titles listed in the JALC Essentially Ellington library. • All eligible charts from the Essentially Ellington library are published by either Warner Bros Publications or Alfred Publishing Co. and prominently feature an Essentially Ellington logo on the cover of the conductor’s score. Remember directors, that in addition to the charts received through membership with the 2018-2019 Essentially Ellington program, you may also elect to perform any of the previously published EE charts. For a complete list of all titles in the Essentially Ellington library, visit jazz.org/ee and select “Library” from within the red “Resources” tab on the right. Each band will receive 25 minutes total for their performance. This includes set-up, tuning, and exit from the stage. A warm-up room will be available to each band 25 minutes prior to their scheduled performance time. Adjudicators will provide a critique of your performance and provide numerical ratings on a festival adjudication sheet. Directors are not required to provide adjudicators with scores. We prefer our judges to listen and observe, rather than to be focused too much on viewing and studying a printed score. 3. provide a listing of the soloists (name and instrument) for each selection, and the entire personnel for the band. 4. designate lead players so that we might be in a better position to identify students should they be considered for an award. Each jazz band will receive a 20-minute clinic with one of our Essentially Ellington clinicians. High School Jazz Combos will be required to perform a minimum of two selections with one composition being a blues. A third selection is optional if placed within the performance time. We encourage everyone in the combo to improvise. Each combo will receive 35 minutes for their performance and post-performance clinic. This includes warm-up onstage, set-up, tuning, performance, clinic, and exit from the stage. Adjudicators will provide a critique of your performance and provide numerical ratings on a festival adjudication sheet. Directors are not required to provide adjudicators with scores. We prefer our judges to watch and listen, rather than be focused too much on a printed score. 1. provide a program guide for the judges. The program guide should list the compositions, composers and/or arrangers, the soloists for each selection, and the entire personnel for the combo. 2. If your two selections do not require the full thirty-five minutes on stage, we invite the adjudicators to work directly with each combo in a clinic setting. We imagine a 15-20 minute performance (2 tunes), followed by a 15-20 minute clinic. Community jazz bands and/or combos are welcome to register and perform at the festival. These bands, selected from across a city or region are now (this is our first year to try this!) eligible for the Outstanding Big Band and/or Outstanding Combo Awards. A $60 coupon redeemable by Jamey Aebersold Jazz will be presented to each of the 5 ensembles listed above. The overall Outstanding Jazz Band will be invited to open the evening concert of the UNC Jazz Band (7:50 pm Saturday, February 16, 2017) with their 3-tune set. The judges will also identify Outstanding Soloists and Outstanding Performers during the festival. At the awards ceremony these individuals will be recognized and provided with a certificate signed by the guest artists. We are pleased to announce that the Christian Scott Quintet will perform at Memorial Hall at 8:00 pm on Friday, February 15, 2018. Call 919-843-3333 for tickets. If you plan to bring a group ask for help at the Carolina Box Office when you call. Tentative Schedule for Saturday, February 16, 2019 (14th annual) North Carolina Regional Essentially Ellington High School Jazz Band Festival at the University of North Carolina – Chapel Hill. All EE events to be held in the Kenan Music Building and Hill Hall. If you have questions about the festival, please contact James Ketch at the University of North Carolina at Chapel Hill. Enclosed is: $150 for 1 ensemble $250 for 2 ens. $300 for 3 ens. $325 for 4 ens. Checks made payable to Carolina Jazz Festival 2016. Tentative Schedule for Saturday, February 16, 2019 (14th annual) North Carolina Regional Essentially Ellington High School Jazz Band Festival at the University of North Carolina – Chapel Hill. All EE events to be held in the Kenan Music Building and if needed Hill Hall. If you have questions about the festival, please contact James Ketch at UNC-Chapel Hill.